This house built ca 1866 at Willow Springs in Fayette County was built of local rock, then plastered over and painted. It featured a wide central hallway and was built over a root cellar. Wilhelm Pagel had a store, supposedly in the front part of the house, and was the local postmaster. The post office, and therefore the community, was named "Rockhouse" after his home. After Wilhelm died in 1873, his wife relinquished the post office and it was moved down the road a few miles and that community became known as Rockhouse. After Magdalena died, the house and part of the property were bought by her daughter and son-in law, Emma and Ernst Albrecht. In the late 1890's the Albrechts added a second story and front porch. By the mid 1930's, the house had deteriorated to the point where snakes were crawling through the walls. 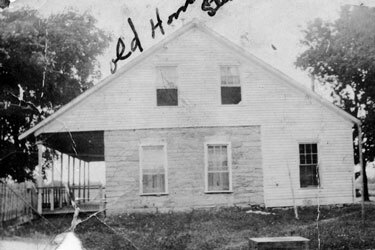 The Albrecht's son, Oscar, tore the house down and built a two-story frame house in its place over the root cellar. Some of the rock house's wavy-glass windows were incorporated into the back of the new house. The rock from the old house was used to build several tenant houses elsewhere on the Albrechts' property. Pictured in this ca 1893 photo are Johanna Zorn Fritsche Pagel (Gottfried's second wife); Oscar, Emma (Wilhelm's daughter), Lillie, Willie, Edwin, and Ernst Albrecht; and an unidentified man (possibly Franz Brauner who worked for the Albrechts). 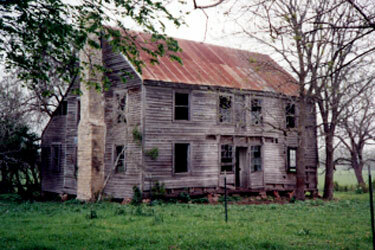 See a later photo of the rock house after a second story was added at the Fayette County TXGenWeb site. Photo contributed by Mary Menking. Carl Friedrich (or Charles) and Johanna Kuehne Pagel built this home north of Hallettsville in 1872. There was a front porch and central hall and stairway. The original kitchen was a separate building, but a kitchen was later added in the rear. Johanna's father, Friedrich Kuehne, taught school in the attic of the house. The front room to the right downstairs featured a stenciled leaf and berry pattern around the ceiling and a painted wainscoting that imitated fine paneling. Dot Waldrip, a Kuehne family descendant, believes that these are the work of Johanna's sister-in-law's family, the Melchiors, who are known for their artwork in homes in the Round Top area. After Charles died, Johanna built a home in Hallettsville that is pictured in the top left corner of this page. Carl "Friedrich" (or Fritz) and Carolina "Wilhelmine" Pagel Fischer built this home near Frelsburg in Colorado County. 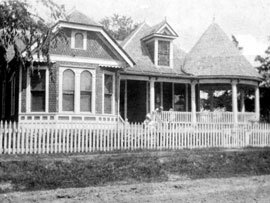 The Fischers were living here when Friedrich died in 1915, but Wilhelmine moved to Lavaca County to live with her daughter Caroline Wiechring in her old age. 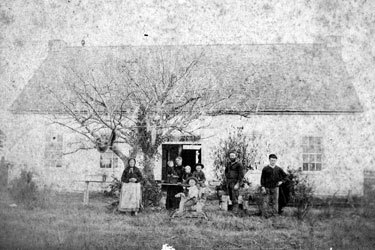 The Fischer's son, Ernst, and his family lived on the farm, but a new house was built . The old one was torn down much later. The property is no longer in the family. Pictured in this ca 1892 photo are Wilhelmine, Louise, and Friedrich Fischer and their daughter and son-in-law, Christine and Oscar Rosse. Photo contributed by Mildred & Theo Schultz. This was the home of Friedrich and Louise "Fredericka" Pagel Ladewig near Breslau in Lavaca County. It featured a deep front porch all the way across the house. The original house was made of stone, but a frame addition spans the rear. The house still stands, but is no longer habitable. There is a noteworthy two-story stone barn elsewhere on the property. Photo contributed by Henry Ladewig, Jr.
William Appelt bought the property that formerly housed Hallettsville's Alma Institute, a women's college, in 1899 and and is said to have built this new home there. It was located a block and a half east of the courthouse. However, a death notice for him in 1905 stated he lived three miles out of town, so perhaps he didn't live here. Their son, Emil, inherited the property, but by 1920 it was a rooming and boarding house. 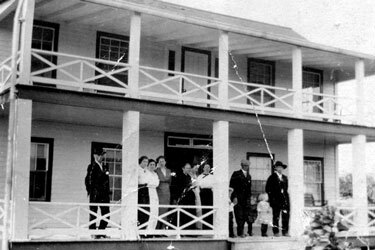 Dr. and Mrs. C. T. Dufner bought the property that year for their home, but it also served as the Dufner Hospital until Dr. Dufner passed away in 1957. It was used as a nursing home for a few years, but new laws requiring fireproof buildings for nursing homes put an end to that in 1960. 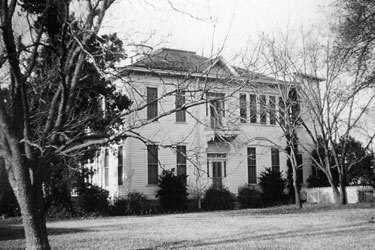 There was talk of turning the home into a historical museum, but in 1961 it was torn down and replaced by the Allen & Allen office building. If you know of another photo of a William and Emilie Appelt home, please let us know. 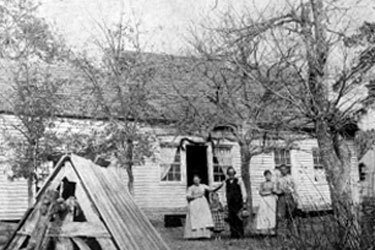 Ernst and Anna Pagel's children were all born at Pagel Settlement on the farm he and Julius had inherited from his father. In 1908 they bought a 320-acre farm near Tivoli in Refugio County and built this house on it. The lumber had to be shipped by barge from Port Lavaca. The house is still standing, although no longer habitable. The farm is now owned by Frank and Marilyn Pagel. Photo contributed by Vicky Orsak. We are still looking for photographs and information about the homes of Gottfried and Friedrike Pagel's other children. If you have a photo or information, please contact Rox Ann Johnson.